This household has been gluten and dairy free for nearly four years now. 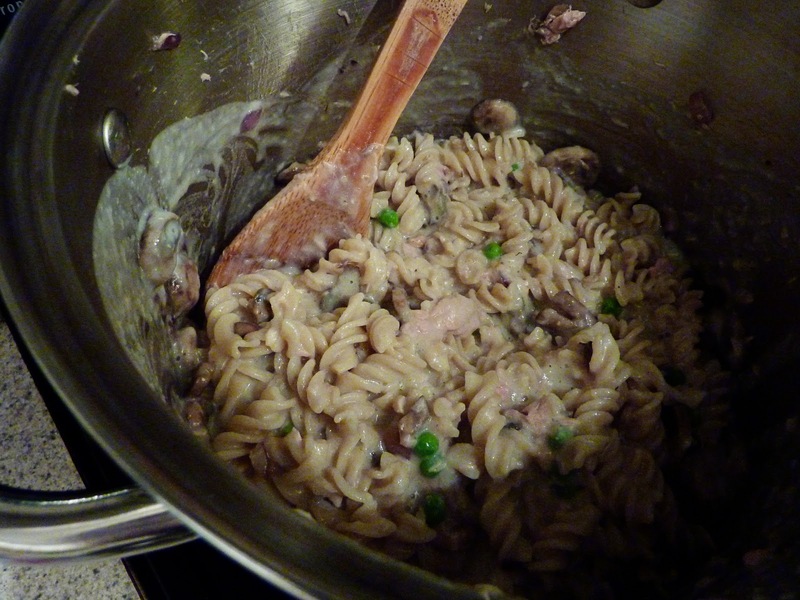 We haven't eaten a creamy casserole even one time since that dreary day when dairy was marked as a contributor to the problems for our then toddler son. We've tried alternative cheese sauces. We've tried blended tofu to mimic the creamy texture expected in a cream sauce. We've tried to pretend that cream simply doesn't matter so much in things like pot pies and casseroles. Each experiment was beyond disappointing, to say the least. Despite my best efforts at recreating our old favorites, we often sat at the table begrudgingly finishing the food on the plate for fear of going to bed hungry. Not so anymore. Bring on the Stellar Tuna Casserole. I'd say it's about time! Preheat oven to 350 degrees. Bring out a large pasta pot and start water to boil. You will also need a large frying pan and a medium sauce pot. Be prepared, you will have three burners going at once. I will outline the process in a few simple steps. 1. Combine sliced potatoes, almond milk and chicken bullion in medium sauce pot. Bring to a boil. 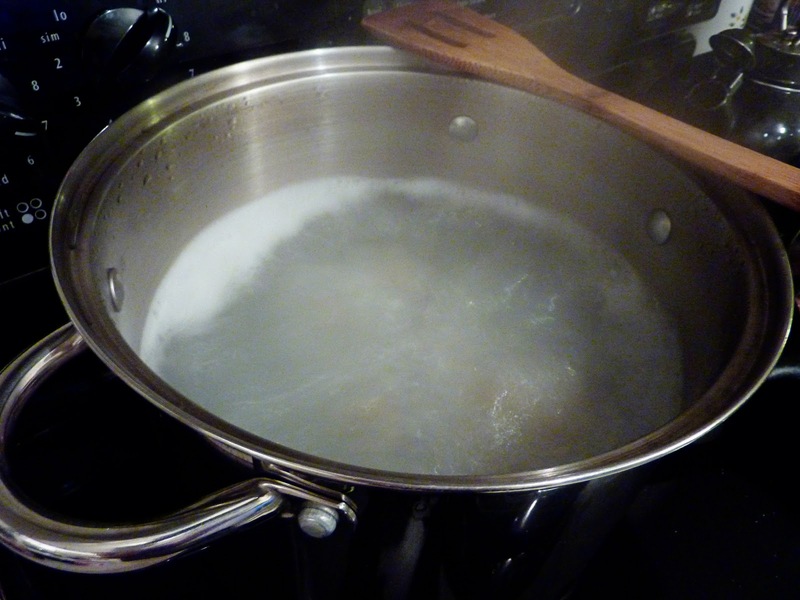 Reduce to a strong simmer for 12 -15 minutes or until the potatoes are tender. 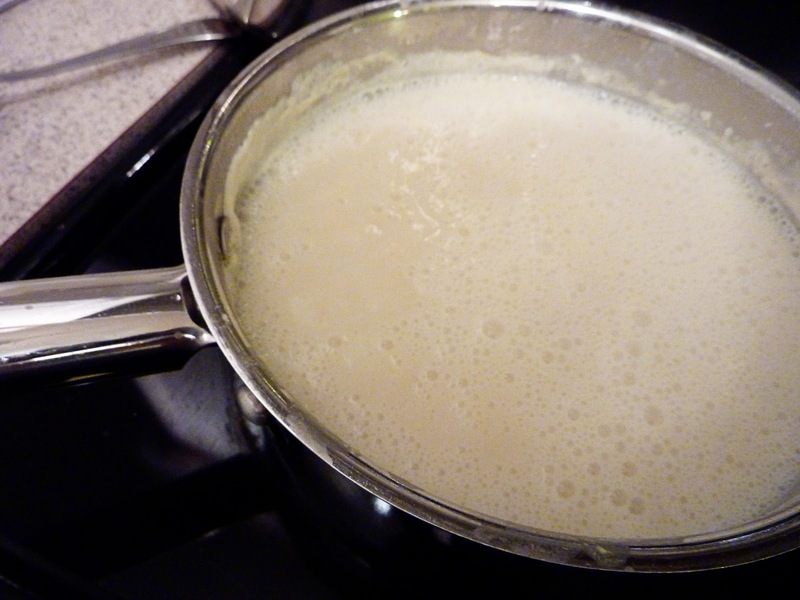 When ready, take off the heat and use an immersion blender to puree mixture into a smooth sauce. 2. Once the potato/milk mixture is underway, heat the olive oil in a skillet and begin sauteing the garlic, onion, mushrooms, salt and pepper. 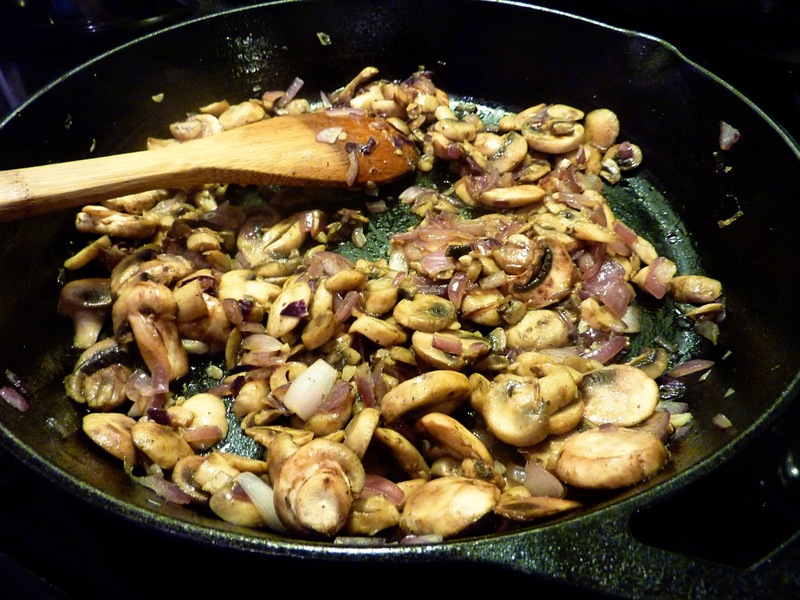 Saute until ingredients are soft and slightly browned, approximately 5 minutes. Turn off the heat and mix in the peas. Let sit. 3. When the water in the pasta pot has come to a rolling boil place the pasta in. Don't forget to generously salt the water. Cook pasta only until al dente. For Tinkyada this is approximately 10 - 11 minutes. Warning: Do NOT overcook the pasta. 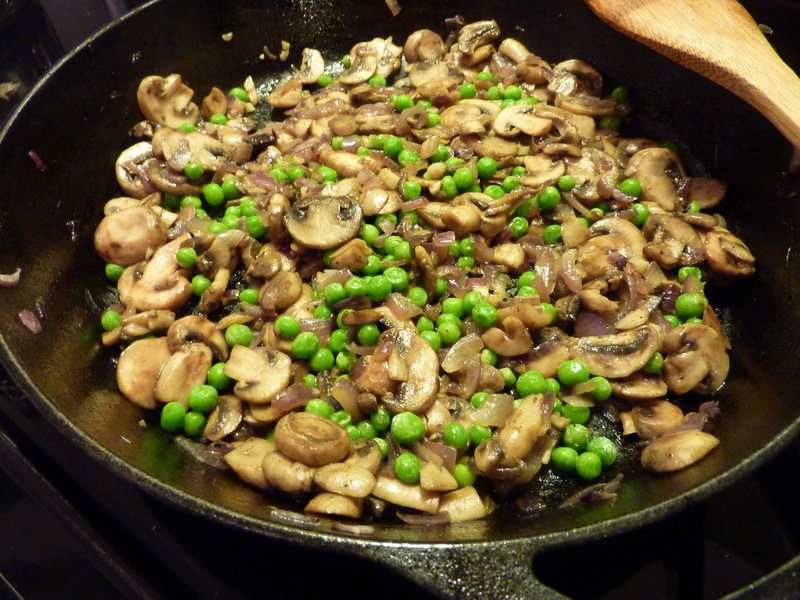 If you do, it will become one big mushy mash for your casserole. 4. 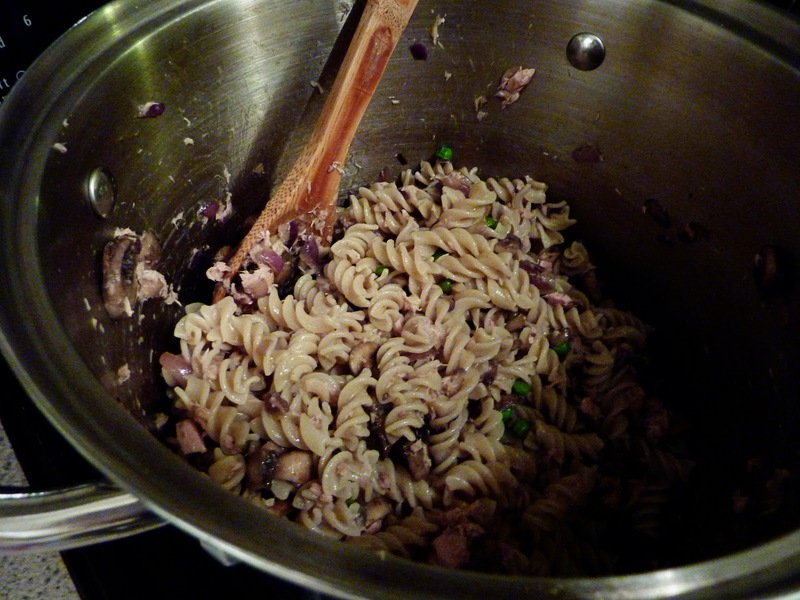 Drain the pasta and rinse with cold water to stop the cooking. Return to pot. 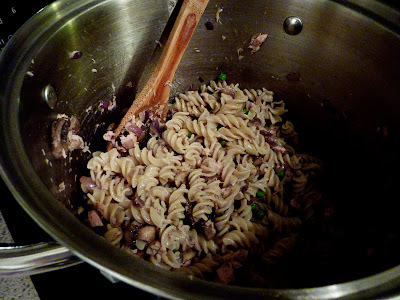 Combine pasta, tuna and sauteed onion/mushroom mix. 5. Add milk mixture and cooking sherry. Stir to combine. 6. Place in large casserole dish. 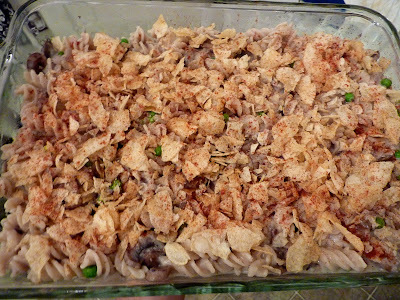 Top with crumbled potato chips or sliced almonds. Sprinkle with paprika. Place in the preheated oven on the center rack for 20-30 minutes or until hot and bubbly. Remove and allow to cool for a couple of minutes before serving. 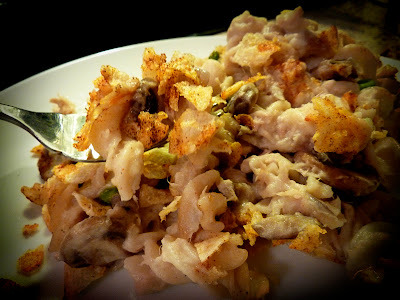 I hope you enjoy this gluten and dairy free casserole as much as we do! On the Eve of Thanksgiving, I realize many of us may be doing a whole lot of this over the next 24 hours. I feel you on this one, Jen. My mantra this past year has been "no more deprivation" with our gluten-free lifestyle. We're swimming in all things decedent and divine these days! We've spent too many years feeling deprived, so now we're making up for lost time.